Navya Naveli is the elder of Shweta Bachchan and Nikhil Nanda's two children. Her brother Agastya celebrated his 18th birthday in November this year. Navya Naveli hasn't featured in films or on television but she is a bona fide celebrity and often finds a spot on the list of trends. Navya recently modelled for her mother's designer label in collaboration with designer Monisha Jaising. Navya counts Khushi Kapoor (daughter of Sridevi and Boney Kapoor) among her close friends from the film circuits. She studied in London with Shah Rukh Khan's son Aryan. Navya's grandparents Amitabh Bachchan and Jaya Bachchan are celebrated actors. Her Uncle Abhishek Bachchan and his wife Aishwarya Rai Bachchan are also actors but nothing has been revealed about Navya's plan to follow in their footsteps. However, in a previous interview to IANS Shweta Bachchan said she'll be "worried" if Navya Naveli wants to act. 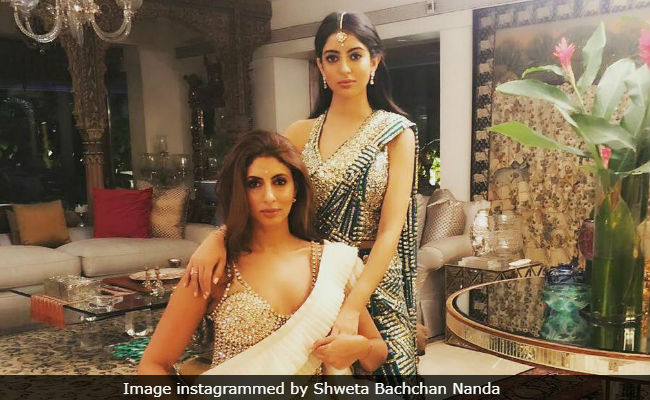 Shweta Bachchan Nanda is a published author - her book Paradise Towers released in October.